Leslie West was a big boy and a hell of a guitarist. These days he’s a shadow of himself weight-wise, but I haven’t heard him play in decades, though he’s still active musically and just put out an album this past year. Unfortunately, Felix Pappalardi died long ago, shot by his wife who claimed it was one of those accidental shootings. Shame. This is a mighty fine album that starts with “Mississippi Queen,” a definite crank it up song belted out by West, and goes into Jack Bruce’s gentle “Theme For an Imaginary Western,” sung by Pappalardi. 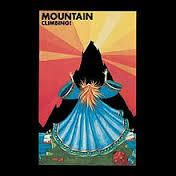 West’s first solo album was titled Mountain, thus the name of the group, and this would be their first album. It’s an interesting combination of voices. Pappalardi’s sweet, almost Jack Bruce-like vocals and West’s from the gut, and he had a big one, raw sound. Good record, and good, though short workout.